I am ashamed to admit that I used to look down on parents that let their children have cell phones before they were teens. That was before I was a parent traveling the world with my toddler daughter. I am now the parent of a 3-year-old that has her own iPad Mini. Yep, I am constantly eating humble pie since becoming a parent, but that is the way it goes I guess. Last year, I wrote a post called 5 Apps That Will SaveYour Life when our daughter, Z was almost 2 years old. She is still using the apps that I mentioned in that post. 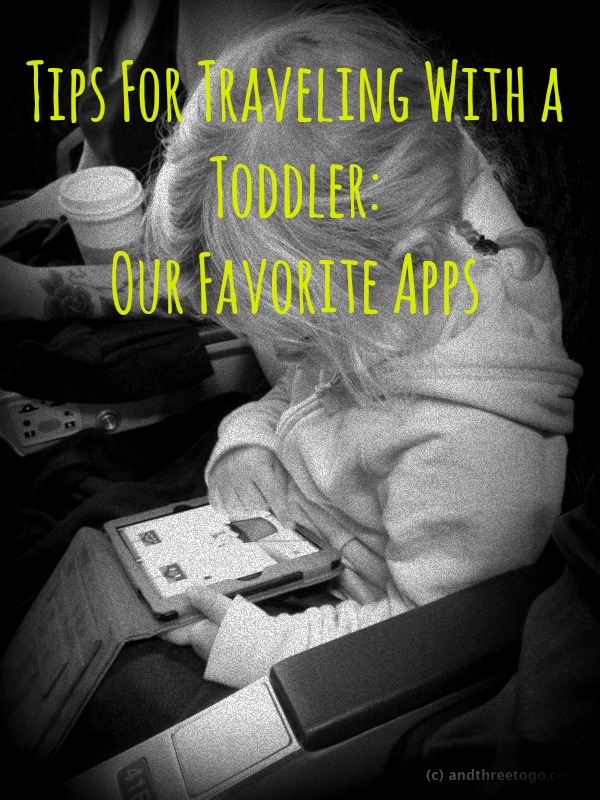 I also had included some apps that helped us as parents as we traveled. I wanted to update the list of our favorite apps, but this time I am concentrating only on our favorite apps for our toddler. For more information on apps to help you adults as you travel, check out this post from Thrifty Travel Mama. A few things before I start: 1) We personally use Apple products, so some of the apps may not be available to Droid users, I will let you know if they are not, 2)We have a daughter so this list may seem a little skewed towards the girly games, but most of them are good for both boys and girls, and 3) These are our opinions and we hope you will agree with us, but won’t be hurt if you don’t. 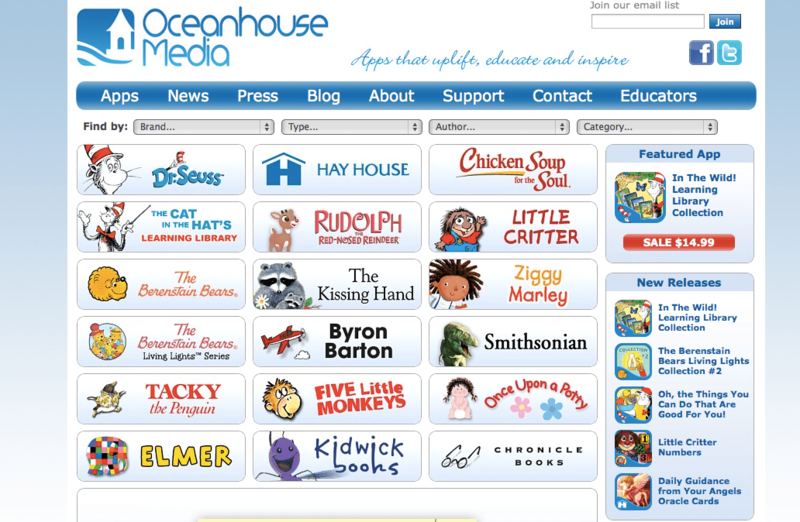 A screenshot of Oceanhouse Media’s website and the choices of books to download. This app is simply a “bookshelf” where you can search for digital story books and download them into this app. They have a huge selection of Dr. Seuss books, Little Critter books, Berenstain Bears books, and many others. The digital books range in price from free to $4.99. This app has been a way for us to carry a ton of books along with us on our travels, all in one light and easy iPad mini. The books are also interactive and each has the choice for you to read it yourself, be read to you, or auto-played. Z often sits and has the stories read to her on her own. This app has helped us to inspire literacy in our toddler without having to lug around heavy books. (Unfortunately this product is only available on iOS products, sorry to all the Android users out there… it might be worth changing just for this app though). The Endless games by OriginatorKids.com are the best apps I have found to help teach our toddler her alphabet, numbers, and sight words. I recommended Endless Alphabet in my post a year ago and still love it, as well as their newer additions. 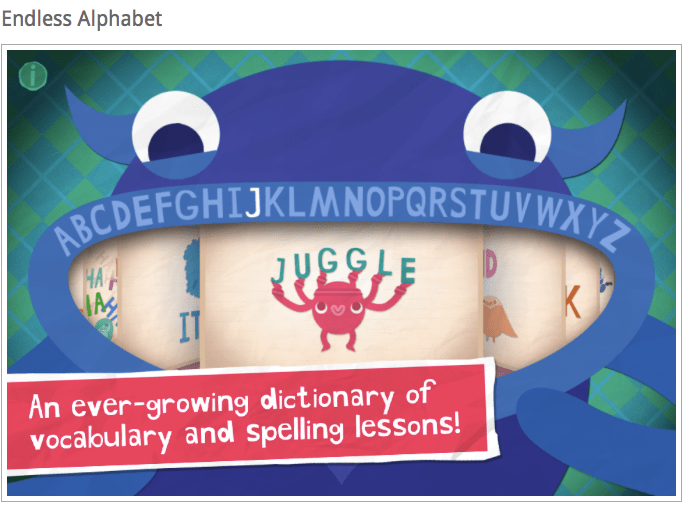 Endless Alphabet teaches children how to use their alphabet to spell the words in the game. They are some pretty serious words, too! Words like contraption, umbrella, and musician are taught by having the child place the letters in correct order. Each letter is said phonetically when the child touches it. The definition of the word is given in a little cartoon using the Endless app monsters after the child correctly matches all the letters. I credit this game with teaching Z her alphabet before she was 2 years old. She still plays this game often and Originator keeps her interested with offering updates with new words often. Endless Numbers teaches a child not only how to count, but also simple addition and subtraction as well. The app is free for numbers one through five. Check it out for free and then buy packs of the higher numbers as you want. Endless Reader is their app that teaches a child to read sight words. It gives a sight word, such as “up” and has the child use their fingers to spell the word by matching the letters, then the word is used in a sentence. Z already reads words like dog, cat, the, and up because of this game. 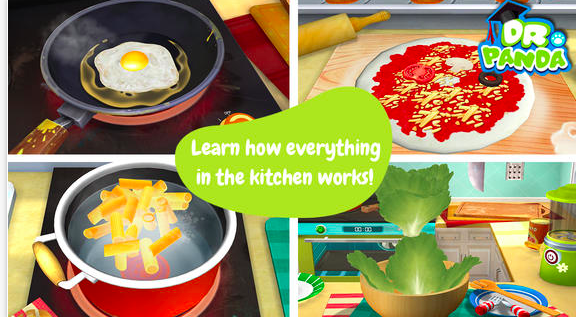 This app is about Dr. Panda and what he cooks for the customers of his restaurant. The player is Dr. Panda, the customers place their order and Dr. Panda has to find the correct ingredients in the kitchen and then cook them to order. The customers (usually an elephant and hippo) are there all the way giving nods or head shakes to let you know if you are picking the right ingredients or ways to cook them. I think that this game is perfect for 3 years and up, it would have been too difficult for Z a year ago. Now, Z likes to play restaurant in real life and makes some pretty amazing imaginary food. I can’t wait until she is old enough to really cook for me! 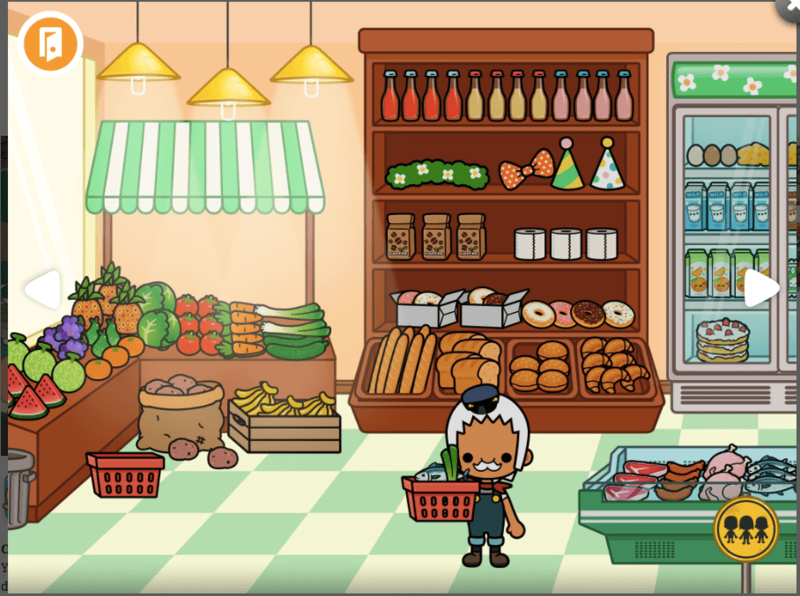 A screenshot of Toca Town’s grocery store. Chad calls this game a toddler “Sims“. In Toca Town you can choose characters to do different tasks around the town. The people are able to do everything and each area is interactive, you can move most of the things in the room, turn the light on and off, play the radio, etc. I thought that it would be too simple for Z, but she loves this game and plays it for hours. On a side note, Z has played and loves most of the TocaBoca apps, you may want to check all of them out. We are huge Disney fans and Disney Junior is one of our favorite channels. 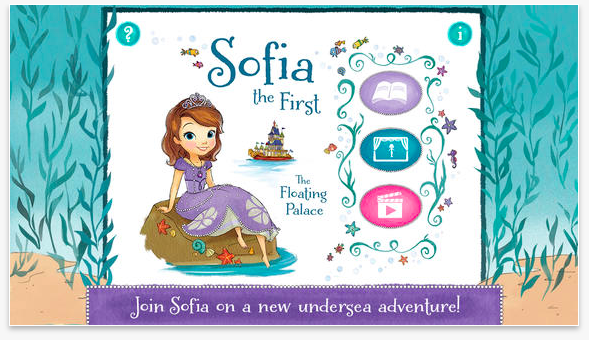 Well, at least it is Z’s favorite channel, and Sofia the First is one of her favorite cartoons. In this app, your child (or you, we don’t judge) is able to create their own story using the their own voice and story telling abilities. It’s a modern-day puppet show that is recorded and able to be emailed to family members or saved for all time. Z loves to make up her own stories for as long as we will let her use her iPad. Just a note of warning though, it also records the surrounding noises, Z has some of Chad and I’s full conversations recorded as we were driving in the car. In order to save her stories without our boring conversations ruining it, we told her she has to let us know when she is recording now. It has helped a lot. So, there they are, our favorite apps for our toddler. Do you let your child play on smart devices? What apps do they (or you) love? Leave a comment and let me know. Also if you need any specific tips for traveling with your toddler, please leave it in the comment and I will see if I can write a post about it!